Miami City Ballet, presented by The Joyce Theater Foundation, took NYC by storm during the Company’s Lincoln Center debut, April 13 -17. For this spectacular appearance on the Koch Theater stage, the Company performed NY premieres of commissioned works, including Justin Peck’s Heatscape, Liam Scarlett’s Viscera, and Alexei Ratmansky’s Symphonic Dances. 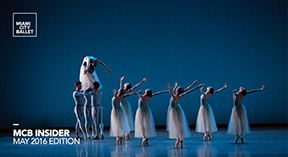 The Company also thrilled audiences with glorious pieces including Twyla Tharp’s Sweet Fields and George Balanchine’s Symphony in Three Movements, Serenade, and Bourrée Fantasque. Miami City Ballet’s tremendous success during the Company’s Lincoln Center debut was accompanied by various glorious reviews. Alastair Macaulay, The New York Times chief dance critic, remarked in one of his reviews, “Of all the ballet troupes who have visited the Koch in recent years, none looks so truly and completely a company … None gives us such warmth and energy.” Marina Harss from Dance Tabs commented, “This is dancing that makes one hungry for more,” Robert Greskovic from The Wall Street Journal remarked, “Rewardingly varied…uncommon depth,” and Nancy Dalva from the New York Observer declared, “Marvelous…What a triumph!” about the Company’s performances.